Do you need a guillotine style paper cutter? Whether you are looking for a classic Ingento Maple Trimmer, a Maple Table Trimmer, or a stack cutter, we carry them all. In fact, we carry the full line of GBC Classicut, MBM Kutrimmer, MBM Triumph, and Papermonster guillotine cutters. You can also choose from the full line of Martin Yale Premier and Dahle Vantage units. All of these models have a similar design with a board for aligning your paper (usually with a measuring ruler and grid) and a lever handle blade on the right side of the machine. However, some models have advanced features such as a paper clamp, blade guard and laser guide. Check out all the options below. This is MyBinding video. 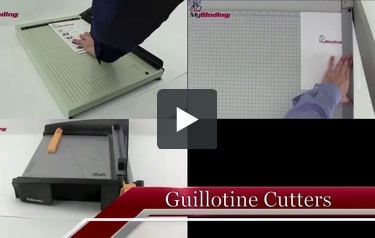 Are you looking for a great guillotine-style paper cutter? Well, you’ve come to the right place. MyBinding has the best and the most. Whether you’re looking for a classic and gentle maple trimmer, a maple table trimmer or a stack cutter, we carry them all. In fact, we carry the full line of GBC classic cut guillotine cutters, MBM cut trimmer cutters, MBM Triumph manual cutters, paper monster trimmer guillotine and other great cutters. We also have the full lines of both Martin-Yale Premier Paper Cutters and Dahli Vantage and Premier guillotine paper cutters. We pride ourselves in our customer service so check out our many videos demonstrating each of our products or give us a call. We’d love to find you exactly what you need. When image matters, MyBinding.